JadeWeserPort was commissioned on 21 September 2012. Image courtesy of Jade WeserPort Realisierungs. An aerial view of the port during construction. Image courtesy of Jade WeserPort Realisierungs. Construction work on the port began in March 2008. Image courtesy of Jade WeserPort Realisierungs. The container cranes measure 1,800t each, with a jib length of 69m and a height of 125m. Image courtesy of Jade WeserPort Realisierungs. JadeWeserPort is a deep-water container port located at the German Bight in Wilhelmshaven on the North Sea Coast of Germany. The idea to construct the port was conceived in 2001 and construction commenced in March 2008. Commissioning took place on 21 September 2012, after much delay. Around 1,000m of the overall 1,725m quayside is currently in operation, with full operations expected by August of 2013. With a capacity of 2.7 million TEU per annum, the new port will be capable of handling some of the largest container vessels in the world. It was built with an investment of €950m ($1.23bn), out of which €350m ($454m) was used for the construction of the superstructures. "The new port will be capable of handling some of the largest container vessels in the world." The port was jointly developed by the two states of Lower Saxony and Bremen by creating a new company called JadeWeserPort Reilisierungs, in which Lower Saxony holds a 50.1% stake and Bremen the remaining 49.9%. EUROGATE is the operator of the port. Construction of the new port was undertaken to meet the rising global demand of deep water container ports to accommodate the largest cargo containers with capacity of up to 12,000 TEU irrespective of the level of tides. The port’s location provides viable opportunities for economic transactions with the Baltic States, Scandinavia, the United Kingdom, Russia and Poland by providing short sea traffic. The site also provides easy access through road and railway networks. A natural 18m water depth and an easy access being at a distance of just 23mi from the open sea provides added advantage. The port terminal is also located adjacent to a logistics park which will provide port-related logistics services. Port of Hamburg, the largest seaport in Germany, lies between the North Sea and the Baltic Sea. It is the second biggest container port in Europe and the 11th biggest in the world. The new port terminal covers an area of 130ha with provisional increase to 400 acres (161.8ha) pencilled in for the near future. It has a container handling area of 650m with a navigational water depth of 18m. 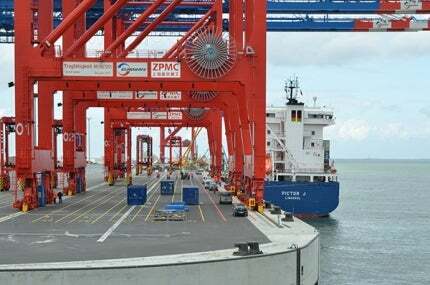 The terminal is made up of four berths, with 16 container cranes located at the northern part. It is equipped with 68 van carriers, eight huge trucks, and six rail-loading cranes at the centre of the port. The container cranes measure 1,800t each, with a jib length of 69m, while the cranes extend 125m high. The port also features an environmentally friendly five-storey terminal building to provide space for offices, recreation rooms and changing rooms for the staff working at the terminal. Construction of the port terminal consisted of reclaiming 370ha of area with a 1,725m-long quay, construction of quay walls, terminal access channels, roads and railway lines, dredging the berth area, construction of the terminal building, and installation of lighting equipments and other essential equipments. "The new port terminal covers an area of 130ha." The port’s construction required 50,000t of steel, 80,000m³ of concrete, 500,000t of bricks and around 40 million cubic metres of sand. Dredgers and floating pile drivers were used for the construction. Dredgers used for the construction of the port were provided by Josef Möbius Bau. Construction of the quay and certain port areas was carried out by a consortium of Bunte, Josef Möbius Bau, Heinrich Hecker and Ludwig Voss. URS Global Operations was responsible for the management, coordination and supervision of the project. The designing and planning of the terminal building was undertaken by Angelis & Partner and Arup. Construction of the access road to the port was undertaken by a consortium of Eurovia Teerbau, JeschkeCulture and Construction, and Fritz Spieker. Construction of the rail access to the port was carried out in four phases. The first phase was undertaken by Jelabau, Siemer + Müller, and J. Tiessler High and Civil Engineering. The remaining three phases were taken on by Matthai Construction, HF Weibe, Stefen, Martin Stein Brecher and K-Nord.